Investors just poured $23 million into perfecting Amy. That may sound a little less weird once you know that Amy is an artificially intelligent personal assistant and the brainchild of a startup called X.ai. Clients can "cc" Amy -- or her counterpart Andrew -- on emails requesting a meeting. Then she takes over the task of coordinating schedules and setting the date. On Thursday, X.ai announced a fresh round of funding led by Two Sigma Ventures, a VC fund that invests in data-focused startups. That funding will help X.ai -- which has been operating in private beta since 2014 -- roll out out its service to the public this summer and release an enterprise edition before the end of the year. But are we ready for robots to take over our calendars? People have grown so accustomed to dealing with human assistants that many have trouble conceptualizing Amy, or other similar services like Clara Labs. While many sing the praises of bots for scheduling meetings, some feel resentful that a robot has been assigned to their correspondence. And people are certainly less forgiving of a robot who schedules a meeting at the wrong location. One of the many entrepreneurs I spoke to said he drew the line at using Amy to schedule meetings with potential investors. "I just think it's disrespectful," he said. "Like, 'I can't be bothered to schedule time with you. Let me pawn you off to my robot so I can get back to better things.'" And many have no idea that they're communicating with a robot. Dennis Mortensen, cofounder of X.ai, previously told CNNMoney that many people have the same reaction when they see Amy cc'ed. "How the hell did they afford an assistant?" One venture capitalist said some investors were concerned when a founder, with a very early stage company, had an assistant schedule a meeting. The founder had to explain that the assistant was a robot -- which cleared the air. Some say it's embarrassing when they finally discover that they've been crafting polite emails to a bot. All that was really needed was the essentials: date, time, location. The "please" and "thank you's" were totally unnecessary. "People can grow accustomed to it, as long as you know upfront that's who you're talking to," said George Nitzburg, a Columbia University adjunct professor who studies the intersection of psychology and technology. But Amy's signature does include a clear identifier: "Artificial intelligence for scheduling meetings." "We didn't expect so many people to say 'wow' because it is identified. We never intended to hide that fact in any way," said Stefanie Syman, head of communications at X.ai. But Nitzburg said it's especially important for businesses like X.ai to be sensitive to the fact that interacting with robots isn't the norm -- yet. Companies need to be mindful, psychologically speaking, of how they're designing their products to interact with people. "We're talking about human behavior and human emotion," he added. "Everything comes down to execution and decisions." 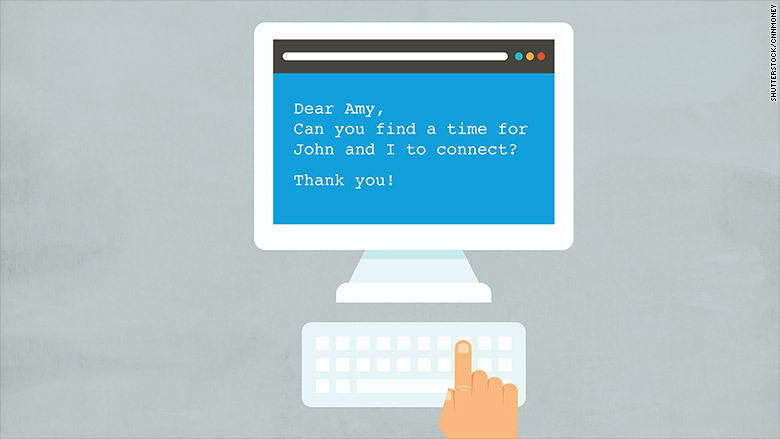 For its part, X.ai has an AI interaction designer, Anna Kelsey, who is tasked with coming up with every possible e-mail response for different meeting scenarios for Amy and Andrew. Amy and Andrew are still in a supervised learning environment (meaning humans double check that data is accurately labeled), but Syman said they respond without supervision. "Amy and Andrew's responses are dynamically composed on the fly."